These seemingly unassuming red fruit berries are, in truth, some of nature’s most wonderful little gems, especially when infused to make a mouthwatering herbal tea. While typically, it is the flower of the Rosa genus or, ‘rose plant’ which is most sought-after for its sheer beauty and natural fragrance, the fruit it bears known as a ‘rosehip’ or sometimes a ‘haw’ is often used for its health-promoting properties. This is not all that rosehip tea can offer, for its flavour upon brewing is as equally enticing as its incredible potential to improve your everyday way of life. Rich in vitamins and minerals, Rosehip Tea (Whole) boasts distinctively tangy, and somewhat sour flavours, reminiscent of cranberries or pomegranates. This unique, tart taste is a true sensation in a cup. Roses have been cultivated for thousands of years worldwide for a variety of reasons. Aside from the renowned flowers and their immense popularity in gardens and bouquets, the fruits known as rosehips have been included in many culinary dishes, including jellies, jams, syrups, marmalades, breads, pies, and salads. In the New World, in particular, roses flourish across the landscape, the indigenous populations have harvested rosehips for their powerful medicinal properties. This is similar to their consumption in much of Europe and Asia. Rosehips and Rosehip Tea was an integral part of Traditional Chinese Medicine (TCM), where they were used to treat kidney and urinary issues. They were likewise used as part of the ancient practice of Indian Ayurvedic Medicine, where rosehips were made into a tonic to improve what modern science knows as cognitive function. During the Second World War, when German blockades halted large quantities of vital supplies to the British Isles, many citrus fruits and supplements were in limited stock. Rosehips, known to contain high levels of Vitamin C were used as a substitute during rationing, and were often made into syrups for citizens and servicemen alike. Consuming rosehip syrups or naturally tea, prevented scurvy, a deficiency disease caused by the lack of Vitamin C. To say rosehip ‘helped to win the war’ would, without a doubt, be an overstatement. However, to say it provided the nation with a much-needed boost both in vitamins and in overall morale would certainly be an accurate depiction of this wonder berry. Brewing Instructions: Rosehip Tea (Whole) may take longer to brew than some other herbal teas. The Kent and Sussex Tea and Coffee Company recommend brewing with freshly boiled water and infusing for 10 to 15 minutes. How to Serve: This beverage is best served as it is. Tasting Notes: Subtler in flavour compared with our Rosehip Tea, this particular herbal tea consists of a delightful earthy-floral infusion, combined with fruity undertones. Perfect for easy afternoon-drinking! Colour in Cup: Pale peach liquor, light in tone. 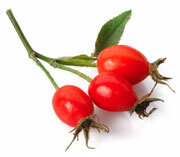 Health Benefits of Rosehip Tea (Whole) - Notably nutritious brew! It contains a wealth of vitamins, minerals, and antioxidants, including Vitamins A, B-Complex, D, E, K, and P, as well as Calcium, Carotenoids, Cobalt, Copper, Flavonoids, Iron, Magnesium, Malic, Potassium, and Zinc. This is just to name a few! Choosing to include Rosehip Tea in your diet may aid in boosting the immune system. This, in turn, can provide you with protection against minor illnesses such as the common cold and flu. If, however, you have been unlucky enough to already get sick, Rosehip Tea (Whole) is the perfect remedy to clean the respiratory tract and clear mucus congestion.